Vincent Price was many things : gourmet chef, author, family man, voice over artist, stage performer and champion for the arts. Yet for all of that he will assuredly and most fondly be remembered by horror movie fans as the iconic pencil-moustached-silken-voiced star of some of the most beloved horror movies of all time. Quite an impressive number of which have achieved cult status with fans of classic movies over the years. However, Vincent Price was not merely a stock performer in the kind of B-horror films for which he became so famous for. 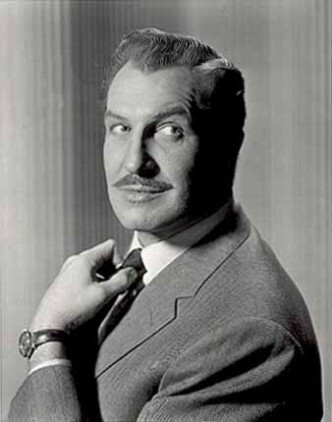 Vincent Price was a prolific actor with nearly 200 title credits to his name, spanning TV and film over nearly six decades... oh and that does not include his radio or theatrical work. 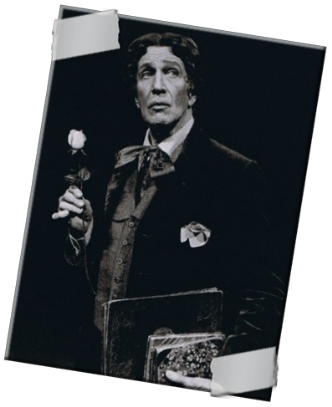 Vincent first appeared on stage to portray the role of Prince Albert in the play “Victoria Regina” at the Broadhurst Theatre in New York on December 26 1935. At the time he was 24 years old. The production was a resounding success running for nearly two years for a total of 517 performances, and as they say : “a star was born”! vivid portrayal of Oscar Wilde won him both critical and popular acclaim. Clive Barnes of the New York Post said Price was ”a delight, witty and moving”, Variety said “Vincent Price is a 'Wilde' delight” and the Washington Post review said the play was “wonderfully moving”. Both Vincent Price himself and later his daughter Victoria, in her 1999 biography of her father, would go on to say that “Diversions and Delights” was the best and most gratifying acting that Price had ever done. He went on to perform the show appropriately eight hundred (800) times from 1977 to 1982 in the United States and internationally. after that, but he cemented his early reputation in 1944 after starring alongside screen legends Gene Tierney and Dana Andrews in the film noir “Laura”. One of the major turning points in his career came in the early 1950's with one of Price's most memorable roles. This was in 1953 when he starred in the original “House of Wax”, which was incidentally the first ever feature film to be shot in 3D with stereophonic sound. Price played the part of Professor Henry Jarrod who guards a terrifying secret to creating remarkably lifelike wax statues. Hitchcock Presents entitled “The Perfect Crime”. 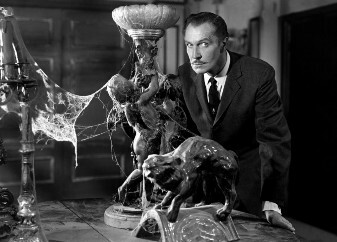 Price then rounded the decade off in strong form with “The Fly”, “The Bat” and the cult favourite “House on Haunted Hill”. The 1960's ushered in(see what I did there?) the period when Vincent Price truly became known as the Master of of the Macabre, Master of Menace or just simply the Master of Horror. This proved to be both a blessing and a curse in later years. 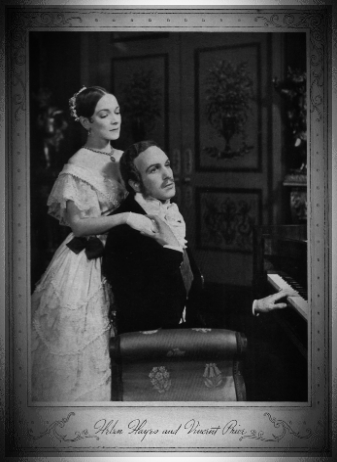 Price in the leading role, Roger Corman as director and American International Pictures(AIP) handling the distribution produced a series of truly classical horror movies, most of which were based on the works of Edgar Allen Poe. These found tremendous success and were partly intended as an American produced alternative to (both capitalize on and compete with) the popular films that came from England's Hammer Studios at the time. 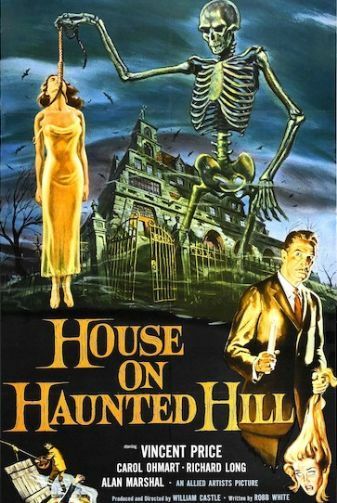 The first product of this idea came in 1960 with “House of Usher” followed swiftly by “Pit and the Pendulum” and “Tales of Terror” in 1961 and 1962 respectively. Building on the popularity of these films AIP released four other Edgar Allen Poe adaptation between 1963 and 1964 namely “The Raven” (1963), “The Haunted Palace” (1963), “The Masque of the Red Death” (1964) and “The Tomb of Ligeia” (1964). Then in early 1964 Price entered into an exclusive contract with American International Pictures(AIP). This guaranteed him the leading role in AIP feature films but also barred him from appearing in horror movies produced by any of AIP's rivals, which included Hammer Studios and Amicus Productions. At first this was not a problem as the first movies to be produced under this agreement were such classic films as “The Tomb of Legeia”, “The Last Man on Earth” and “Witchfinder General”. However, as time went on the quality of the films that AIP had Vincent Price appearing in went steadily downhill. Simultaneously in terms of production quality, story and popularity with the film-going public. One of the great tragedies that sprung from this, at least from the perspective of horror movie fans, is the fact the Vincent Price never appeared in any of the Hammer Studio films of the period. Price himself expressed similar sentiments in a letter to his agent, where he laments over an offer that had been extended to him to appear in the 1970 Amicus film ”The House that Dripped Blood”. Therein he writes : "I'd like to do it, it certainly can't hurt to be in a good film - it might even carry me over the next lousy one AIP might make me do" . It is also known that Hammer wanted Price to play the protagonist in “Taste The Blood of Dracula” and Jess Franco also approached Vincent Price to play the role of Van Helsing opposite Christopher Lee in “Count Dracula”. Due to his contractual obligations to AIP he was forced to decline all these offers. In her book “The Complete Films of Vincent Price”(Citadel Press, 1995/2000) author Lucy Chase Williams writes :“Price's decade-long association with American International Pictures, at first a guarantee of steady employment, was now a double edged sword. The A.I.P. films had cemented his status as the horror king, but the terms of his contract prohibited him from capitalizing on that reputation and making genre films for any other studios”. After his association with AIP came to a close with the 1974 feature ”Madhouse”, Price significantly scaled back his film work, choosing instead to concentrate more on select TV and voice over projects as well as pursuing his other passions. His next significant film would be 1983's “House of the Long Shadows” that united Peter Cushing, Christopher Lee, Vincent Price and John Caradine. A dream cast indeed for any true horror movie fan! (Batman) and Burt Ward (Robin). When asked to stop, he blithely replied : “With a full arsenal? ... Never! !” and in so doing sparked a full scale egg fight on the set. Price also made an appeared as a featured guest on a particularly memorable episode of “The Muppet Show”, where Kermit the Frog sprouts vampire fangs and attacks Vincent Price during an interview. Radio was also quite familiar ground to Price as he appeared on and hosted a variety of radio shows. As early as 1943, he voiced the role of Simon Templar in the radio production of “The Saint” that ran until 1951. During the 1970's he hosted the BBC mystery series ”The Price of Fear”. The sound of his hypnotically silken voice can also be heard on Alice Cooper's Welcome to my Nightmare, Michael Jackson's Thriller, Tim Burton's 1982 Short film “Vincent”, “The 13 Ghosts of Scoody-Doo” and “The Great Mouse Detective”, amongst others. Listen to Vincen Price as The Saint. 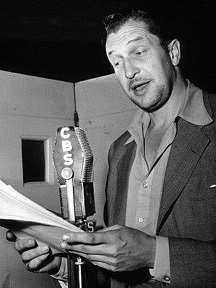 Vincent Price voices the role of the saint in this 1951 radio play. 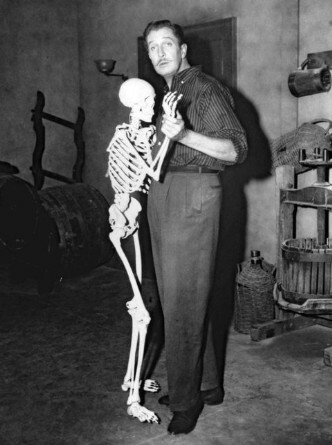 Vincent Price never truly retired and kept on working until very late in life. He was a lifelong smoker, suffered from emphysema, and also developed Parkinson's disease. Rumour has it that especially the latter was a major contributing factor to him leaving the PBS series ”Mystery!”, a show that he hosted from 1980 to 1989. His role in Tim Burton's 1990 film “Edward Scissorhands” was intended to be a more substantial one but his filming schedule and on-screen role had to be truncated due to concerns over his health. During the following years he only appeared in three further works. He leant his voice to an episode of "Tiny Toon Adventures" in 1991 as well as the 1993 animated feature "The Princess and the Cobbler", where he voiced the character of ZigZag. The last on-screen appearance of Vincent Price was to be in the 1992 TV movie "The Heart of Justice" alongside Dennis Hopper and Jennifer Connelly. He passed away on the 25th of October 1993 at the UCLA Medical Center due to complications resulting from lung cancer, he was 82 years old. Price was cremated and his ashes scattered off of Point Dume in Malibu, California. He is survived by his son Vincent Barrett Price as well as his daughter Mary Victoria Price, who was so named after the play that established Price as an actor : "Victoria Regina". at Yale and later at the Courtauld Institute at the University of London, and opened several art galleries during his life. After visiting the campus of East Los Angeles College in 1951 he donated nearly 90 individual pieces of art from his personal collection, alongside a substantial lump sum, to the East Los Angeles College - thusly endowing the Vincent Price Art Museum at Monterey Park. on his famous name to provide credibility and awareness amongst the public but also on his expertise to source the art works and compile the catalogue. This gave birth to what became known as the Vincent Price Collection of Fine Art. At the programs conclusion in 1971 an estimated fifty thousand (50 000) works of art had been sold. He was also appointed as a member of the Fine Arts Commission for the White House, the Board of Archives of American Art, president of the Arts Council at UCLA and served as a former commissioner of the Indian Arts and Crafts Board of the U.S. Department of the Interior. He was honoured with no less than two stars on the Hollywood walk of fame. The first for his contribution to film and the other for his work in television. 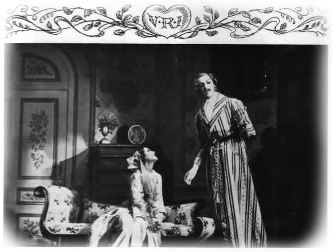 1The play re-opened in 1938 for a further 87 performances at the Martin Beck Theatre before going on a national tour, but this was without Vincent Price as a member of the cast. 2Unless AIP were involved in some capacity or AIP granted Vincent Price dispensation to do so, such in the case of “Theatre of Blood”(1973).